Fibroblast/Plasma is a revolutionary face lift procedure that requires no surgery. It tightens and lifts the skin with instant results. 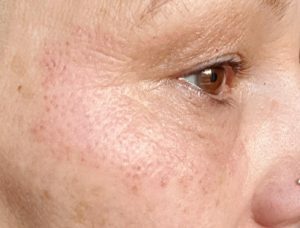 Fibroblast/Plasma is a non-surgical non-invasive treatment that shrinks excess skin, bags and wrinkles. It is revolutionary in wrinkle smoothing and eyelid tightening, dramatically reducing hooded eyelids. 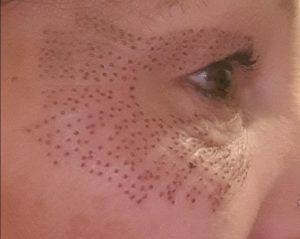 Fibroplex Fibroblast is a very safe, minimally invasive and effective type of treatment that utilises plasma technology. Plasma consists of ionised particles that are charged. Fibroplex Fibroblast uses plasma to modify the skin by sublimation (turning the surface into gas). The beam generates heat and causes sublimation on the outermost part of the epidermis (outer layer of the skin), without damage to the surrounding or deeper structures of the skin. In doing so, the tissue underneath is protected from heat whilst the surface of the skin contracts and heels in order to effect results. Healing is quick and scar free, improving skin elasticity and resulting in smoothness. Fibroplex Fibroblast is a very precise treatment which gives good correction with minimal downtime. The results are long lasting. 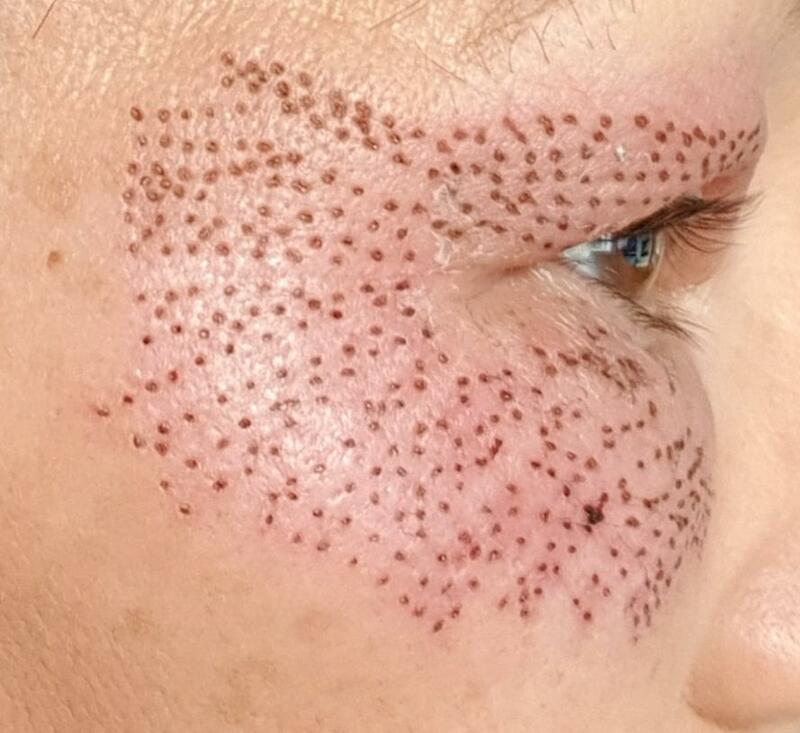 A series of tiny brown spots are strategically placed on the skin using a tiny sterile plasma probe. The pinpoint energy is the magic of the treatment. 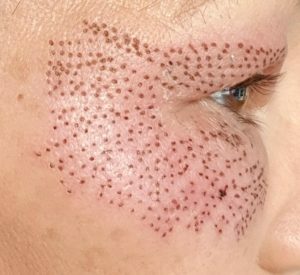 Due to the variety and arrangements of the points the energy produced can reduce excess skin; the results being that the skin are concentrated on is clearly tightened. The small Fibroblast plasma flash, in edition to its evaporation effect, simultaneously exerts a curative and tissue tightening effect. This ensures rapid and scar-less healing. The elasticity of the skin is improved and a distinctive tightening is made possible. Fibroblast is a downtime treatment, You will have visual marks on the treatment areas and the skin may swell. Some people can react quite severally with swelling and for a few day will not be a pretty sight, that is why we recommend a few days off work. We will give you some medical grade camouflage concealer and mineral make up can be used until the scabs fall of, usually 5 to 7 days. For the best results from your treatment it is important that you follow all aftercare as instructed. Following treatment it is normal to have some swelling. This can be significant around the eyes and can last for several days. Cold compresses may be applied to reduce the swelling. If the swelling is more severe an anti-inflammatory medication and/or anti-histamine may help alleviate the swelling. Crusting will develop over the treated area. This will usually be brown or black on the surface of the skin and will flake off over the following days. It can take over 2 weeks to completely disappear. Do not pick at these scabs as this may lead to scarring or infection. It is essential that you keep the treatment area clean, dry and protected. We advise that you do not apply moisturisers until all the scabs have fallen off. It is important that you wear sunscreen after treatment and avoid sunbeds for at least 3 months. 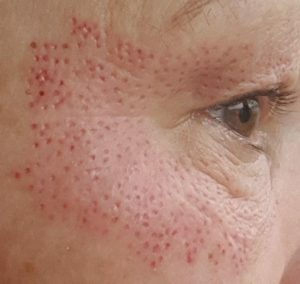 Is fibroblast painful? I will not lie to you. We all have a different threshold to pain some people sail through the treatment others find certain areas a little more sensitive. You may feel certain areas are more sensitive than others. 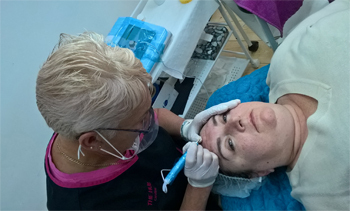 We apply an aesthetic cream before treatment to help minimise any pain. Are there any side effects? 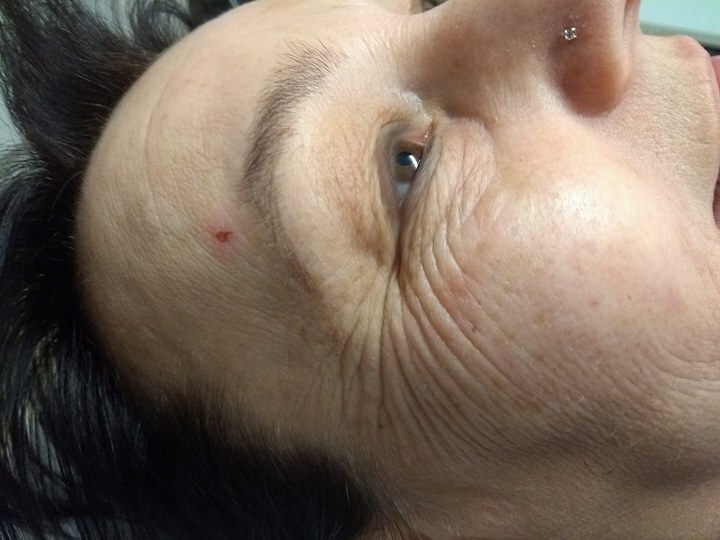 Immediately after treatment the area may be red. 1-2 days after treatment the area may swell. After 5-7 days, the sloughing of the wound healing process have disappeared, Slight redness after is no longer visible after 3 weeks. How long does each treatment session take? A session last around 30 minutes with instant results. Also allow another 30 minutes for the aesthetic to work before the treatment starts. Is the treatment permanent? Yes. Once the skin fibres are shortened, the effects are permanent. Will I need more than one treatment? This depends on the area treated and the results that you wish to have. At your consultation we will discuss this and I will advise you on how many treatments that i believe you require. We will do all follow on treatments at half the price you have paid. If you require any more information Please contact us for a free consultation. Below is a price guide. It is important that you have a consultation as I will be able to give you your own bespoke price. The more areas covered the better the price will be for you. If you require further treatments I will also give you this price at your consultation and it will usually be half of first treatment price. Please be aware that you may need a follow on treatment to achieve a better result. Maximum treatments per area is 4 (It is very rare for anyone to need this many treatment).